Yesterday I briefly commented on the differences between conservatism in Sweden and on Ireland (some discussions that are no longer current in Sweden may be in Ireland and vice versa, was my argument). 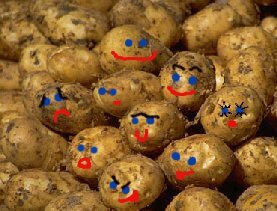 And when talking about Ireland, how can one not be reminded of the tragic potato monoculture incident that led up to the potato famine of 1845? 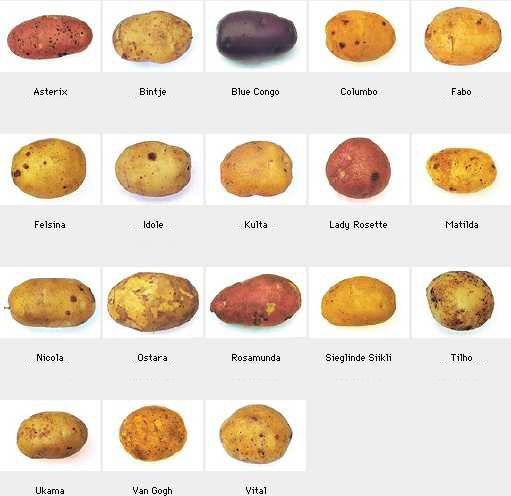 Close to my heart and related to potatos and monocultures are plant breeders' rights, a type of intellectual property right that is close to patent rights but applicable only to plants varieties ("varieties" like the ones illustrated below). The right entails a 20 or 25 year long protection "term" within which you are the only plant breeder who are allowed to retail your particular type of plant variety. Just as patents, it protects the rights holder from having other people continue "breeding" on their particular plant variety for commercial purposes. The association to the on-going potato war of Belgium and ensuing intellectual property details are also not far from my mind. Dramatic headlines and democratic musings ensue as a field of potatoes outside Gent University Agricultural Department was liberated, or vandalized, by a group of activists disagreeing with the covert cultivation of GMO crops on open fields (no control over where the crops spread) in a privately-funded research project where the proceeds of the research was to fall in into the hands of the funder. The university calls the potato liberation "a scientific catastrophe and a sign that democracy is not working well" (my translation). I am of the firm belief that the democratic deficit, and the tragedies to science, agriculture and society to be found herein, lie in the circumstance that the crops are destined to fall subject to an intellecual property right that can have an impact on people who've mistakenly become associated with aforementioned crop. As much as I respect research, since the mid-1990s there have been worrying tendencies at the European Patent Office to include plants within what's considered patentable matter. The plant variety rights are somewhat "adapted" for agriculture in so far as you're allowed to save seeds, basically (a patent right would require you to renew your license/buy new seeds for each year you want to continue industrial application of the crop). There is not really any good way of telling which type of right the private investor in the Gentsian potato field was planning to go for at the end of the research project. But say the university and their sponsors opt for getting the "weaker" right (which is the plant breeders' right in this case).In the origins of plant variety rights I seem to recall potato farmers in the UK protested loudly their fears that the sudden emergence of an intellecual property right in the field would cause a big ownership concentration in the seed providers. Their fears turned out to be entirely justified - the market for providing original seeds is currently very centralized and intellectual property rights encourage further centralization of originators. Certainly there are reasons to criticize the university of Gent for this project, even if they label it research? Plant breeders' rights are typically pushed by large seed enterprises (Monsanto springs to mind, but they're by no means the only actor on this market) in regions of the world where patent offices feel disinclined to include plants in the patentable subject matter, namely Latin America (who appear to be having quite a lot of unique potatos per country/region). Thus it is that most Latin American countries seem to have updated or strengthened their plant variety protection laws in the last five years. Particularly in Chile, these actions were criticized for benefiting primarily foreign investors. I would hate it for my university to be able to avoid responsibility for participating in the perpetuation of such market strategies by vague alusions to democracy and science. Below is a sign naming various forms of potatos and the characteristic looks of each sort (list of older varieties here, pre-1960s). The rumour goes that Asterix is slowly disappearing from the market after it was discovered to be weak against a particular type of pest or mould. I like Columbo and Ostara, eat Blue Congo because it looks cool (it's dark blue!) and would like to try "Matilda". The most common sorts of potatos found in Swedish supermarkets are King Edward and Asterix. Quayle spells "potatoe", you spell "potato".